That’s how much you and I have spent on lawyers for our Pier – so far. To help ease that pain, there’s mention of a relatively minor rebate coming our way ($121,912). Anyone else get that uneasy feeling of a selling feature tossed a little too hard, trying to convince us to step back and take the pitch? $1,349,952.00. A very precise number indeed. Does that mean it’s entirely accurate? It’s unclear if “spent” means fees “billed and paid or payable”, or just “paid”. As well, while it’s clear those fees are strictly for outside counsel – no measure was offered for costs incurred inside the City’s legal department, nor for additional related costs to taxpayers for other staff, consultants and our elected officials over the years. And while optimistic is the word-of-the-day at City Hall, no one has advised us the end is actually near. That’s not encouraging. As the City goes deeper into mediation/litigation, that’s when legal time and work really takes off. At the end of 2013, readers of this blog took a few swings at predictions. Here’s what you surmised at that time…. What do you think now? Take another swing….. If each of us could make decisions with the benefit of hindsight, life would be a whole lot easier. City Hall didn’t have that luxury with the Pier project either. For those on social media and around water coolers who would’ve had all the right answers, let’s hope you run for Council in 2014, and win! On a realistic note, it’s hard to believe any major City project will encounter so many substantive problems and missteps again. 2002 = Council first announces plan to revitalize waterfront, including the Pier. 2005-2006 = 220-meter structure with original construction budget of $6.2 million. ; Pier redesigned to 132 meters and Council awards $6.5 million contract; budget later increased to $8.1 million. 2007-2009 = construction begins with hoped-for finish in 2008; construction goes bad and stops; finger-pointing starts. 2010-2012 = negotiations stop and lawsuit starts; new Mayor/Council elected plus new project manager and contractor hired to finish Pier; construction re-starts. 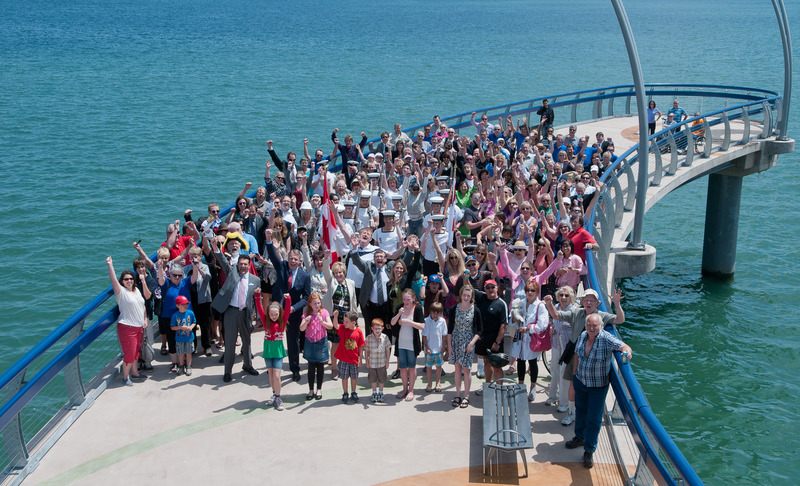 2013 = Pier officially opens, total construction costs of $14.4 million. And no one has talked much about costs to maintain/repair that structure over time. Imagine what all that money and energy could have been put towards locally – instead of merely one pier which is nice to look at, walk on and take great photos from. That exercise is important. It reminds us about our community’s greatest priorities. The Pier itself was never a need. It’s certainly a nice-to-have public feature and attraction (leaving aside its costs). We do seem happy to show the Pier off, but is it generally considered a source of ‘civic pride’? Time heals, and will tell. Getting back to the lawsuit….ultimately, each party has a lot at stake. However, as with most wars about money and reputation, I expect we’ll be hardpressed to find a decisive ‘winner’ at the end. Well, to be candid about my colleagues, the lawyers will do well for themselves. I’ve shared these comments before – and, unfortunately, my original sense remains that we’ll own a Pier which cost nearly $20 million to build (love to be wrong and, perhaps, the lawsuit’s final outcome keeps Burlington far away from that ugly number!). *** By choosing not to disclose anything about legals much earlier and providing regular updates, City Hall only created mistrust about what’s going on with the lawsuit and overblown expectations about the actual costs. .
Only Ward 2 Councillor Meed Ward was uncompromisingly consistent about early disclosure; regrettably, only our Ward 4 Councillor Dennison still hasn’t embraced its merits (contrary to his view, based on my extremely limited information as a citizen, I don’t believe it harms the City’s strategic position to disclose at this stage). *** With so many eyes on this matter, fuller accountability and transparency should have been paramount from the very outset (e.g. no one has, to my knowledge, advised taxpayers if the initial selection of lawyers was done by way of proposals/bids). In fairness, the new Council in 2010 pledged to do that, and made efforts – leaving out ongoing legals costs undermined them. Until now. Let’s hope City Hall learns from this experience for high-priority, high-profile and high-cost files going forward. As voters, we can have short memories and be surprisingly forgiving. Will the Pier project have any significant impact on October 27th? That ticking noise? It’s the sound of your decision getting closer every day. This entry was posted in 2014 Municipal Election, Burlington by Brian Heagle. Bookmark the permalink.